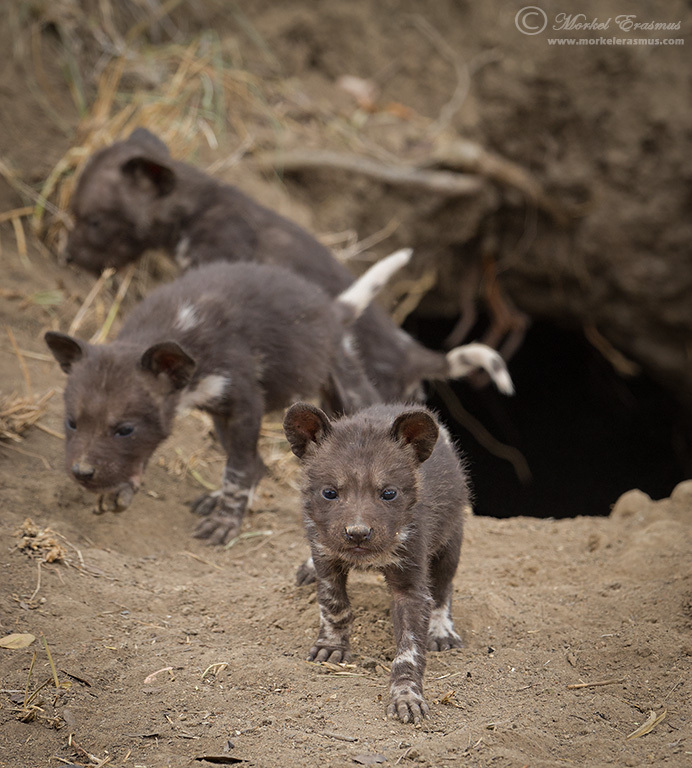 Last year, my wife and I had an incredible privilege: we witnessed the moment a massive litter of 17 highly endangered African Wild Dog (Painted Dog) puppies came out of their den for the very first time. We were in the Lowveld on a family holiday, and got the chance to head out with Grant Beverley for the day. 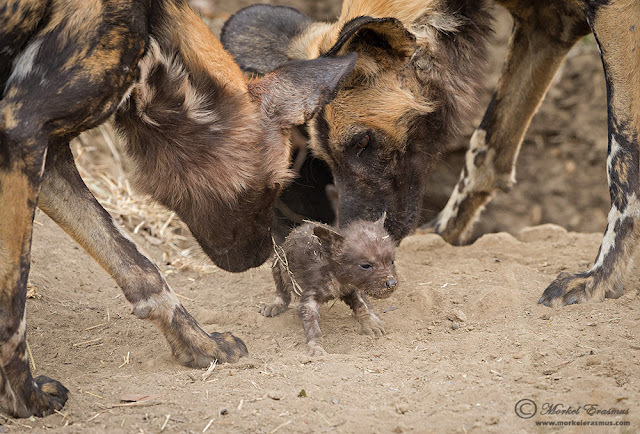 Grant heads up the EWT (Endangered Wildlife Trust) Wild Dog research and monitoring for the Greater Kruger area of South Africa. 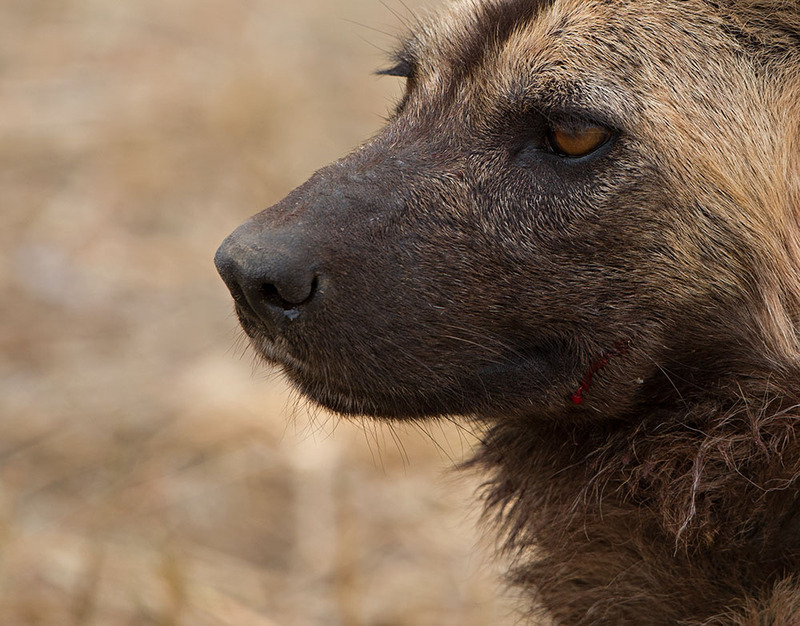 We visited two separate packs of the enigmatic "painted wolf". The first one was situated in the Zandspruit Aero Estate, in the town of Hoedspruit. 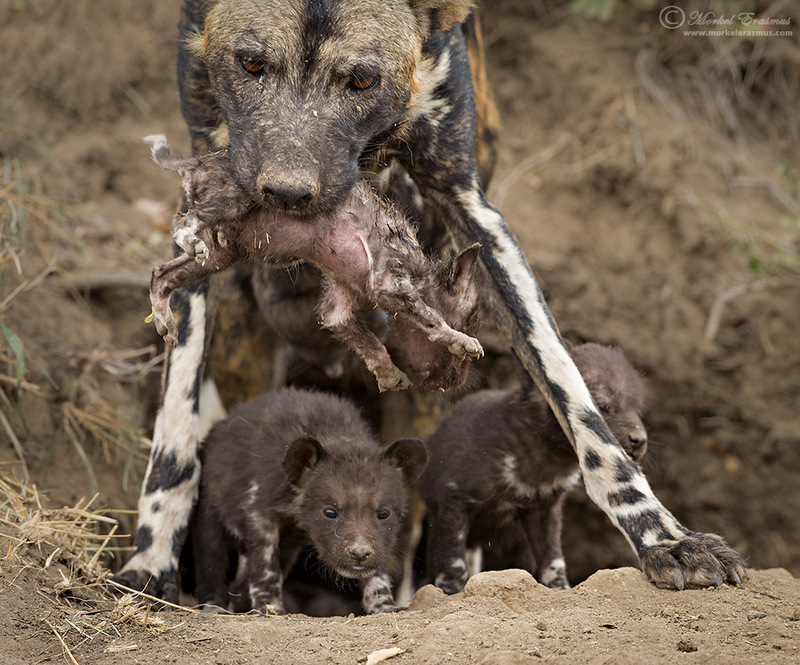 To see these animals adapting and denning with puppies in a residential eco-estate where people were developing holiday homes was quite something! We only caught fleeting glimpses of the alpha female of this pack, and decided to head out to the Ngala Private Game Reserve bordering the Orpen gate of the Kruger National Park. Last year, the alpha female of this pack gave birth to a whopping 17 puppies! 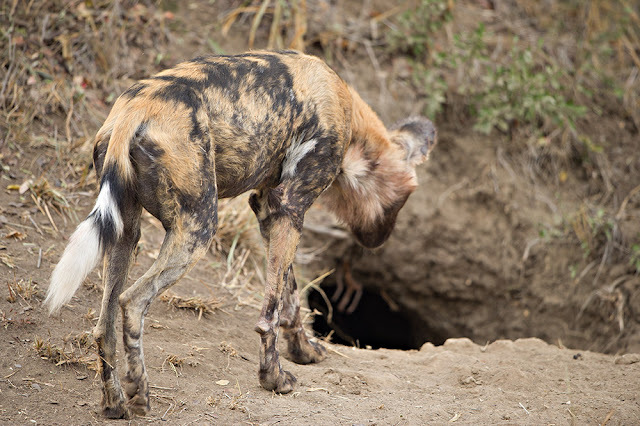 They had, at that point, never ventured out of the den. Grant was hoping that the pack would possibly call them out for the first time (he visited this den nearly every day, was in contact with the Ngala guides, and had camera traps installed at all his monitored den sites). 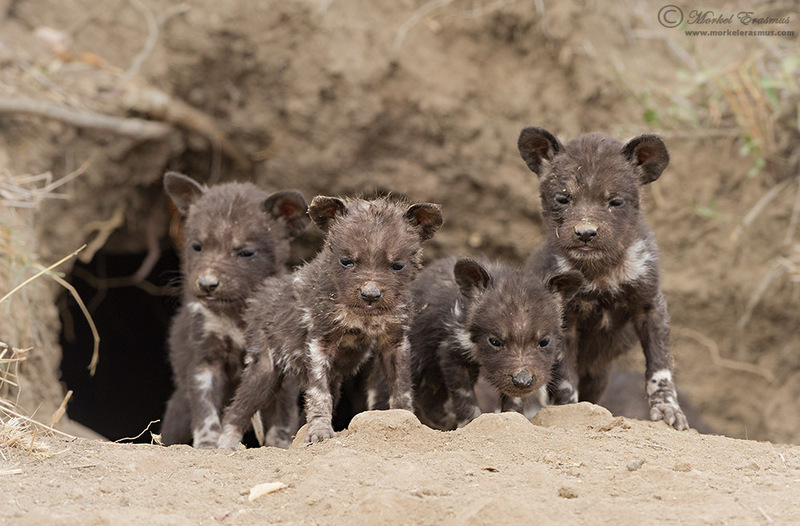 When we arrived, the pack adults were lazing about, and I was able to capture some portraits of them. It was evident that they had recently made a kill, as their faces were covered in fresh blood. It looked like we were in for a long wait that would possibly not result in any visual of the pups. Suddenly, one of the adults moved towards the den (seemingly an abandoned warthog burrow). More of the adults moved towards the den entrance, with some starting to vocalise with yelps and chirps...and then two little faces appeared from the abyss! Followed by a couple more! Here's a short video clip of what we saw! 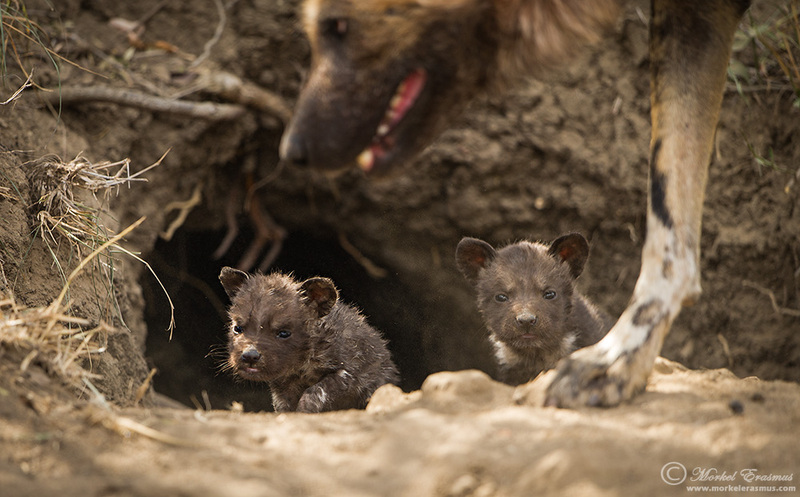 We also sat and watched as the pups explored around their den for the first time, how some of the adults haphazardly handled the roughed up the runts of the litter, and how they all eventually were signaled by the alpha female that it was time to get back to the safety of the den. I hope that you are not bored by now with these images! It is very rare for a single female to have this many puppies. 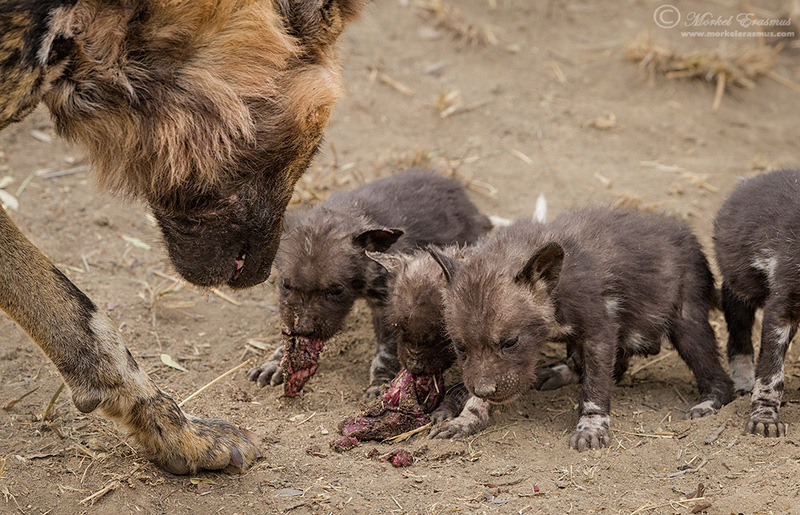 They survived much longer than anyone could have dreamed, as the pack cared well for them and protected them. 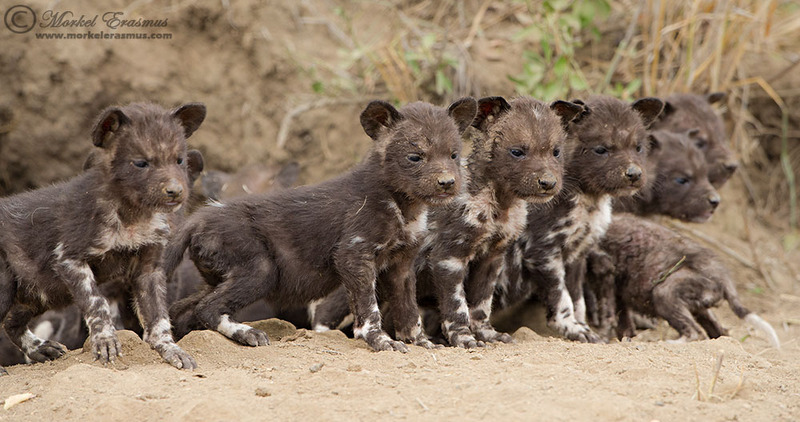 In the meantime, the pack has split and regrouped with other dogs many times, so it's hard to determine exactly how many of the 17 pups have seen their first "birthday". 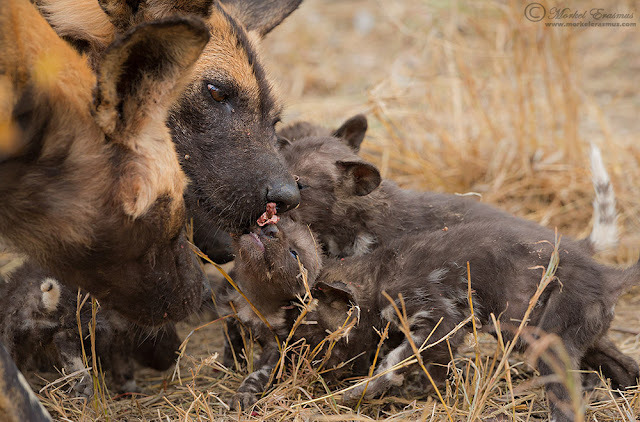 The work that Grant and the EWT are doing is immensely important in ensuring the viability and genetic diversity of the South African population of this rare predator. Their territories are vast, and as human encroachment keeps fragmenting the amount of land under dedicated conservation, the pressure on them will mount. 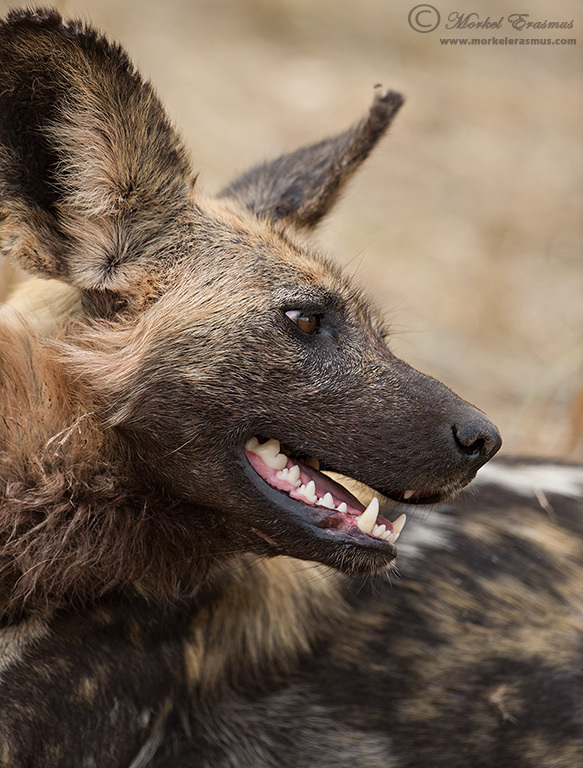 Your donations can keep this team focused on monitoring and managing the greater Kruger meta-population with long-term survival and sustainability in mind. Please consider making a donation! Thank you for viewing and reading! 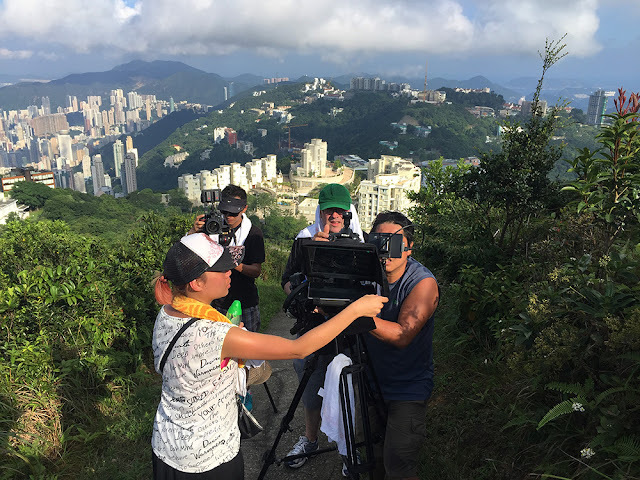 In my previous post of this series, I shared some behind-the-scenes photos and info on the video shoot I did with Nikon Asia in Hong Kong last year. The weather in Hong Kong was quite gloomy most days - and the smog was evident. It was a new environment for me to be shooting in, I do quite prefer being out in nature! This week's video is about the distinction between prime and zoom lenses, I hope you find it insightful! I had an amazing crew to work with on these shoots. 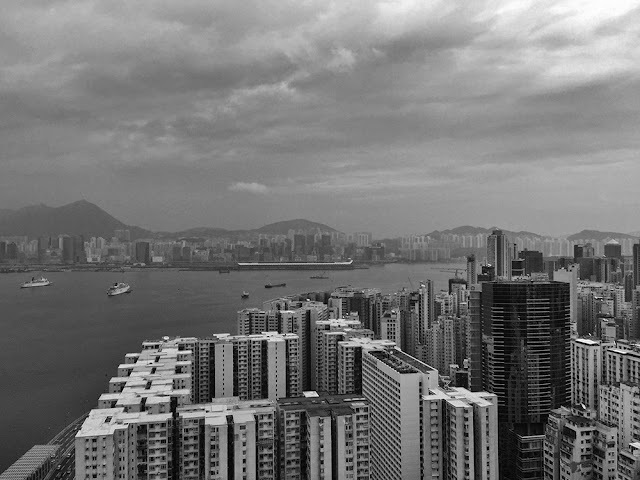 Working in the extreme humidity of Hong Kong all day was quite a challenge, but it worked out well! Stay tuned for more videos and behind-the-scenes photos and stories!